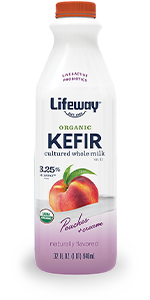 Rich and creamy, Lifeway Organic Peaches and Cream Whole Milk Kefir is wholesome and satisfying. Each bottle is made with certified organic, full fat milk for an indulgent, nutritious beverage. With only 1g of added sugar per ounce, our Peaches and Cream Whole Milk Kefir is delicious poured over cereal, blended into smoothies, or on its own! Pasteurized Cultured Organic Grade A Milk, Organic Cane Sugar, Pectin, Organic Peach Flavor, Organic Vanilla Extract, Organic Annatto Extract (For Color), Vitamin D3.